Essays are one of the easiest forms of academic writing to learn, since they have a basic format and don’t require the strict citation used in research papers. 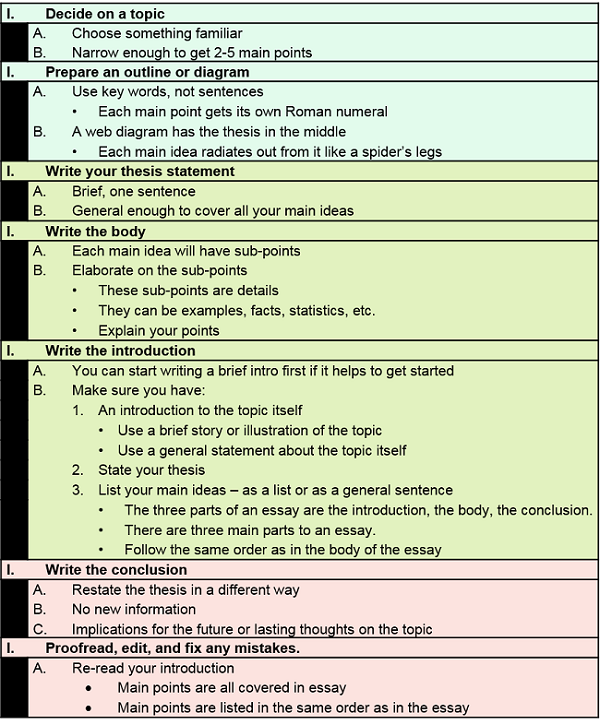 Once students learn how to write a paragraph, with the main idea and supporting details, they are able to write an essay. Paragraph 1: The introduction includes the introduction to the topic, thesis statement, and a preview of the main ideas that support the thesis. Paragraph 2: The first main idea (topic sentence) backs up the thesis with supporting details and examples or specific details. Paragraph 3: The second main idea (topic sentence) backs up the thesis with supporting details and examples or specific details. Paragraph 4: The third main idea (topic sentence) backs up the thesis with supporting details and examples or specific details. Paragraph 5: The conclusion restates the thesis statement; it may predict future implications or show the importance of the thesis statement now. But DO NOT include NEW ideas. Below is an example of how an outline should look. It also explains how to write an essay. Essays are used whenever a writer is required to or wants to express ideas and opinions that don’t use formal research. They are generally short, so are quicker and easier to read than a book, as well as faster to write. Historically, they have been used whenever important issues need to be brought to the public’s attention for those reasons. They are used in academic settings to help students learn to express themselves and to prepare for learning to write research papers.